My life and the guitars that have visited it. It’s been 1,175 days since my last post here. That’s 3 years, 2 months, and 18 days (excluding today). Almost 168 weeks. 28,200 hours. 1,692,000 minutes. 101,520,000 seconds. Not the longest time, but not the shortest either. Life feels completely different from just a few years ago. Better. So what has gtr1ab been up to you ask? Check out @gtr1ab on Instagram. That’s what I’ve been up to. There have been a lot of guitar shenanigans. I started playing bass in a band. I have explored many cities and countries for guitars. Some things are still around from 2015. A lot of things have been added. Some things have come and gone in that time, even some of the stuff in this picture from 2018. Let’s see what happens next! When I visited the Chicago Music Exchange, I found my new measuring stick. You know what I’m talking about. That guitar that you would really like to purchase, but really shouldn’t. It plays great. It has a great sound. It feels fantastic. And it is technically not where your money should be going. So it becomes your measuring stick. Do I want to spend money on this new clutch for my car or would I rather have the 1964 Guild Starfire III? New clutch. Would I rather have my kids’ college educations funded or the 1964 Guild Starfire III? Would I rather have a new amp or the 1964 Guild Starfire III? Would I rather go on vacation with my family or have the 1964 Guild Starfire III? 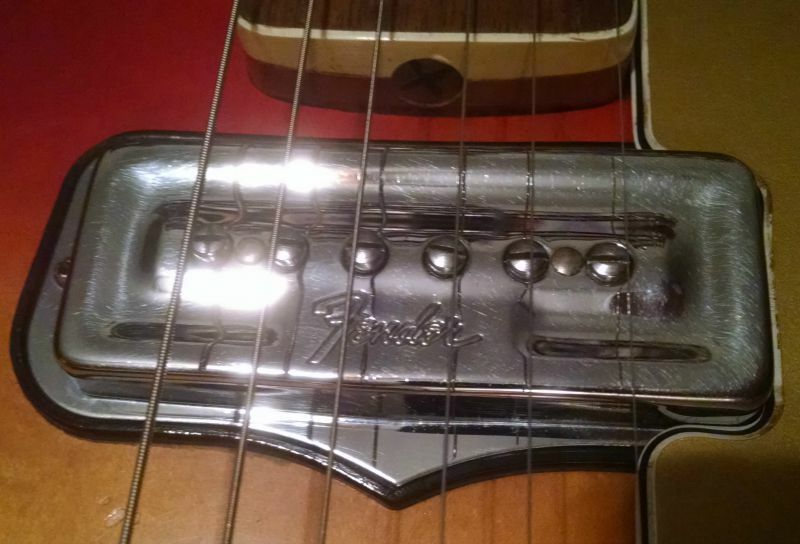 Would I rather buy my wife’s new gaming rig for Fallout4 or have the 1964 Guild Starfire III? 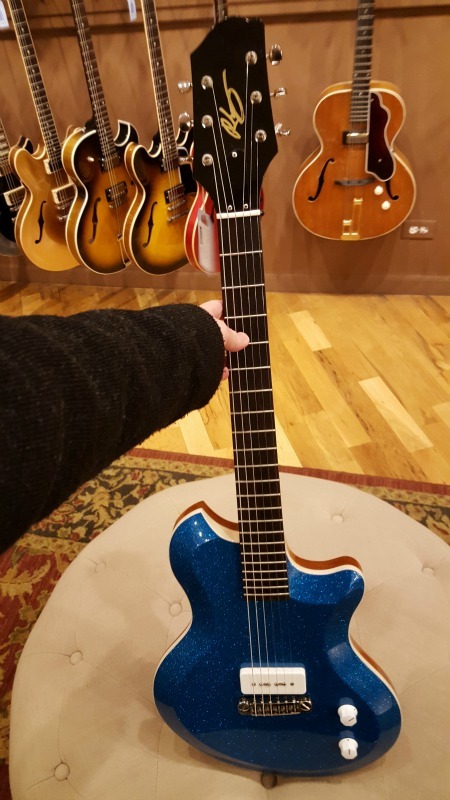 Would I rather have a my mortgage paid or a 1964 Guild Starfire III? The questions and comparisons just keep on coming. Sometimes the answer is no. Sometimes the answer is yes. But I find that the chance to get a “new” guitar is stopped with the desire to live and pay for the rest of everyday life. I have a lot of guitars. I have had more. I play the guitars I have, and enjoy them immensely. But I also go days without playing the guitars I have. However, I do drive my car with the new clutch a lot. I do live in my house on a fairly regular basis. I do go on vacation from time to time. I do love my kids. My wife built an amazing computer for playing Fallout 4! So what is your measuring stick? And when does it win? Should it? A few weeks ago I purchased a Strymon Flint reverb and tremolo pedal at Chicago Music Exchange. And now it is part of my pedalboard! As I have mentioned or described in the past, I had an Electro Harmonix Stereo Pulsar tremolo and EHX Holy Grail reverb that I got for cheap at a local thrift shop. The reverb just didn’t do it for me in the long run and as much as I liked the trem, it just wasn’t something I used a lot. And that is a lot of pedal board real estate. But my ModTone Vintage Analog Delay was not working as a reverb in the long run either. So I splurged and got the Flint after trying it with a bunch of other reverb pedals. It is fairly high price, but I justified it by getting a tremolo in the same unit. I would’ve spent the same amount of money on separate reverb and tremolo pedals anyway. Right? Right! In order to keep my other pedals, including the looper/feedback modified OhHoNo pedal that currently has nothing in the loop, I took off my tuner. I haven’t noticed a big difference in the sound without the buffer that was in the tuner, but I am loving having dedicated reverb and tremolo back on my pedalboard. Combine that with my POG2 and the two delays with my volume pedal and I am having a blast with ambient swells and oceans of echo and reverb underneath what I am playing! Or I can just go with the tremolo and feel it wash through whatever chords I’m playing. And having a warm reverb is just incredible for those occasional blue notes that I hit just right! 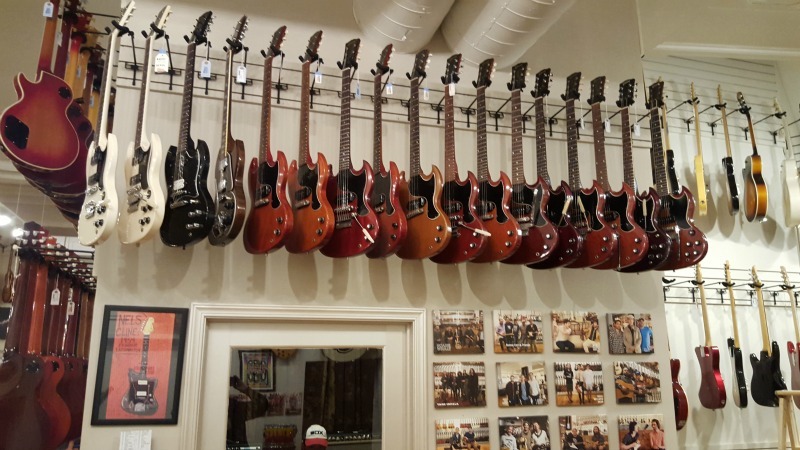 I was in Chicago last week for work, but was able to make a trip or two to the Chicago Music Exchange. Oh, hello row of 60’s and 70’s SG Juniors and Specials. Nice to meet you. Hi 50’s guitars. 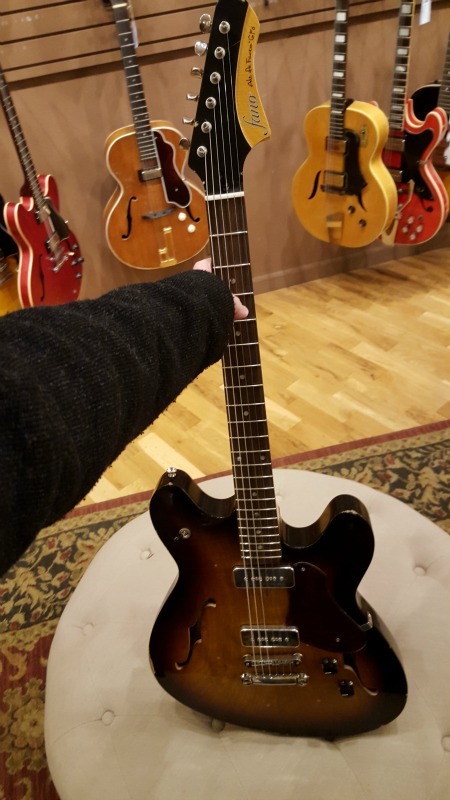 I can’t believe I actually got to play a Gibson ES-225! So amazing. I still prefer the P-90’s of the ES-125DC, but this was very cool. Hi 60’s hollow bodies! John Lennon would be proud of that Epiphone. I enjoyed it. And that Gibson ES-330 is amazing in the “naturally aged” cherry. Something about a 50 year old guitar. Hi history and art made from wood and metal and plastic. I finally got to play a Rhoney. I’ve been listening to their podcast for a while, but never seen one in the flesh. It was fun to play. The body was surprisingly small. I liked it! The Fano is a guitar I have always wanted to play. When I first learned about the Fender Starcaster, the Fano was the only version I could find in production at the time. And it has a comfort belly contour. Perfect! And those pick ups! Perfection…but still out of my price range! And I finally got to play a Reverend. I really liked the neck on this one. Overall a great guitar, but not what I’m looking for right now. Thank you Chicago Music Exchange for creating a space that feels as comfortable as my living room, as historic as a museum, and a positive shopping experience. I will post about my Strymon Flint next time! 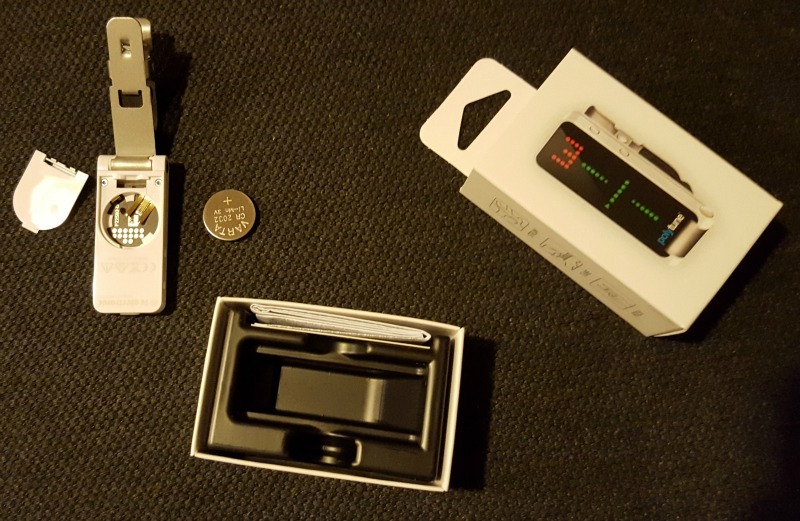 In my attempts to get back into blogging here on a regular basis, I bought a new tuner. Here is the box. Here I am opening the box. Gotta put the battery in. Now I use it on everything in the house! Did you know my son vibrates at A sharp? 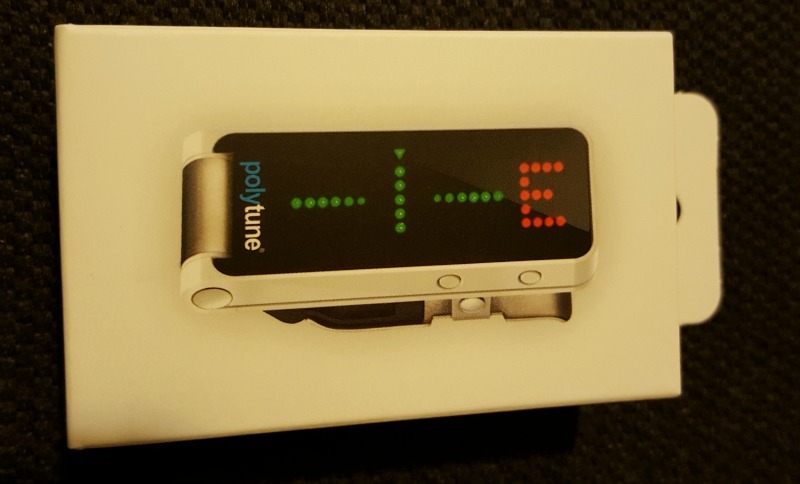 The Polytune clip on is pretty nice. It has a few negatives with the tuner not being able to rotate on the clip. It folds in and out, but rotation would allow me to set it exactly how I want. But the reality is that it is very accurate. And it works very quickly. It is bright. 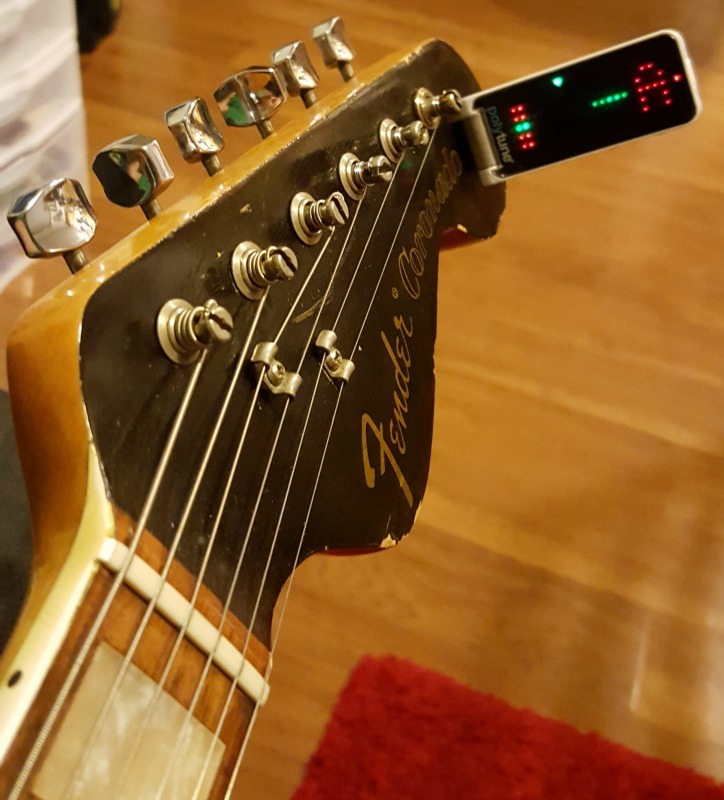 I generally use the single note tuner on each string and then use the polytune to see how all the strings interact with each other. It looks like I will be taking my Boss TU-2 Tuner pedal off my pedalboard. Maybe I’ll add a reverb? Future post topic? Probably! I haven’t blogged in a while because life seems to be getting in the way of typing. But that’s ok, because I’m alive and I’ve been playing this! I’ll get back into the habit of blogging. I’ve got pictures to share from the last Seattle Tacoma guitar show. I’ve been having fun with music. Things are going well! I did it! 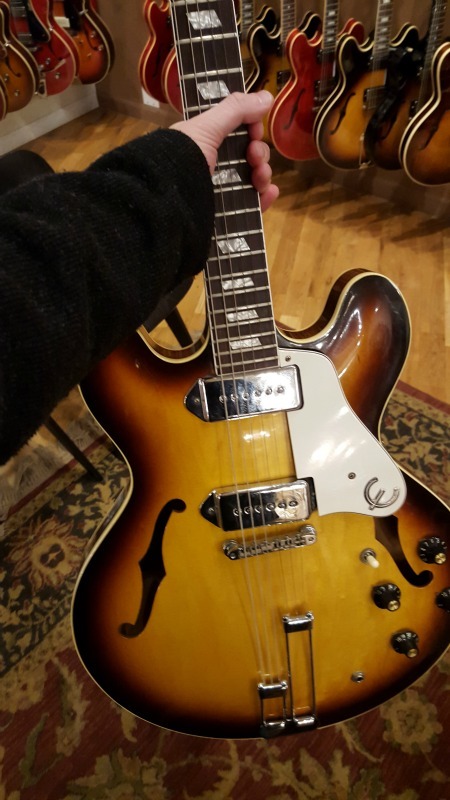 I pulled the trigger on a hollow body guitar and I ended up with the 1973 Fender Coronado II at my local guitar shop. It has a fender neck, but it has what can only be described as a Gretch body. And those pickups are loud! It will need a fret job in the future, but most of my guitars are getting to that point. I like low frets. And the set up from my local shop is spot on. I am very happy with it. 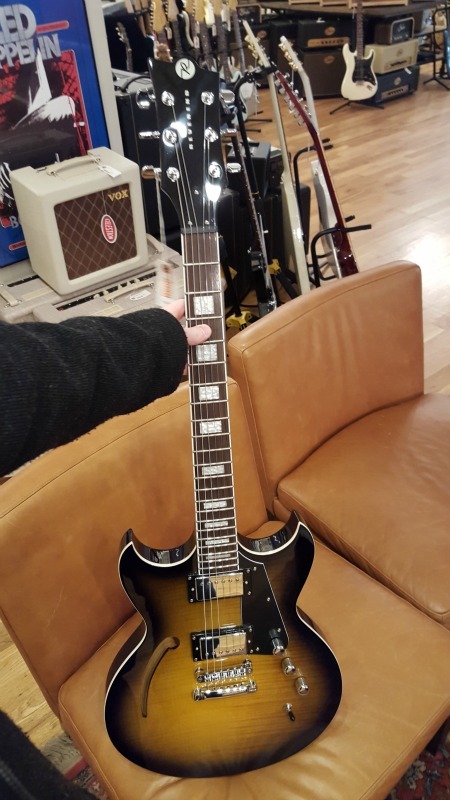 However the pickups make me want to replace the Gibson 490’s in my 62 SG Jr with some sort of dog eared P-90’s so it goes back to the SG Jr it originally was (or the SG Special I wish it was). But enough about my other guitars. This is all about the new to me Coronado II. It plays well through my Franzel Super Champ Sportster. It is certainly a feedback machine, but I can minimize that with body placement and volume control. Enjoy the pictures because I’m enjoying the guitar! My friend has an old Silver Cadet by Ibanez from a long time ago. It has been sitting in a really cool looking hard shell case for years with a broken high E string and a lot of cat hair. Because I am always looking for guitar projects, I offered to clean it and set it up. And so it begins. Strings off. Next is cleaning everything. Putting it back together. Complete set up. Wish me luck! I’ve noticed this one during past visits to one of my local guitar shops, but hadn’t played it until this week. I really liked it! The neck is well worn and the whole thing rings out when I play it. I really liked it! Oh, man. How does this compete with my desire for some form of a Gibson ES-125TDC? Let’s not even talk about the almost identical Hagstrom! Both are hollow bodies. Both sound good with their interesting versions of single coils (historic P-90’s versus unique DeArmond pickups ). One was a budget level student guitar and the other was a premium flag ship attempt. Both look really cool! However, they do not fall in the same price range. We shall see what happens! My family and I went camping with friends. We had a great time. Our kids played together. We stayed up late in the evening chatting around the campfire. It would’ve been perfect for my old garage sale acoustic guitar. But I didn’t bring it. Because in all reality, it wouldn’t have been perfect. No one was there to sing. No one was there to hear me noodle on the guitar. They were there to relax. To roast marshmallows. To make s’mores. To go hiking and swimming. But these friends are nice. So one night as we are sitting around the campfire and the kids had already gone to bed, one of my friends asked what my current dream guitar is. Just asking that question in that way…”current dream guitar” shows great insight. So I described how much I love my light and thin SG. I described how much I love my chambered Warmoth strat with the Firebird neck. I explained the recent love for full hollow body, but thin line guitars. Then I described a thinline strat with the back contour that I may need to have someone make for me someday! The rest of the group moved on with their discussions, but this friend and I enjoyed our conversation. He described his dabbling with guitar when he was young, but stopped because his guitar just didn’t seem set up right. We laughed about how much depth there is to this topic, just like any topic you really care about. And then we joined the rest of the conversation and moved on to other topics. But it was a nice reminder of how much I love this stuff!